Join 18,000 others and follow Sean Hull on twitter @hullsean. 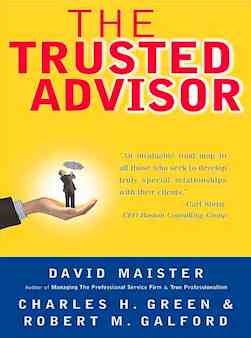 If you’re a freelancer, consultant, or service provider of any kind, you can surely gain a lot from reading David Maister’s book The Trusted Advisor. There are so many ways we can improve, let’s take a look. Right out of the gates, Trusted Advisor is offering us some of those very characteristics. The first chapter alone is worth the purchase price. It may sound surprising to consider a calculation for trust. Let’s take a look. These are all words we know well, but to truly understand them, Maister lays them out very nicely for us. He takes an interesting approach. Our credibility is the words we use, as we describe what we’ve done. Reliability is the actions we take, arriving on time, doing what we promised to do, delivering etc. Intimacy is about emotions, empathizing with your clients needs. And lastly Self-orientation, which may be the toughest one, which involves putting your client first. He then turns it all on it’s head. How are people have have poor marks in one of those areas characterized? Poor marks in credibility, a windbag, who is all talk. Low score in reliability, that person is irresponsible. How about bad marks in intimacy, they are thought of as technicians. Ouch! And how about if you score badly in self-orientation, devious is your cross to bear. Does that sound counterintuitive? I think as an engineer particularly, that may be hard to wrap your head around. I was just hired, so the client must want my advice and solutions, right? Ultimately yes, but first they may want someone to listen to them. Listen, understand their position & discuss. Really to empathize with what they’ve been going through. The more you can do that, the more confidence they will have in your solving those problems & be ready for you to take action. We’re all trying to be better listeners, at least I hope we are. I’ve seen lots of lists of things listeners do. What about what they don’t do? Let’s turn things on their head. We’ve probably all fallen prey to one of these mistakes, so we all have work to do! You’ve heard the refrain, but it’s not easy to do. Taking ownership means assuming the pain & worries of your client as if they were your own. As I learned in one engagement, sometimes it means taking the fall.